The saw bone machine consists of a frame, a motor, a circular saw, a translation table, and an electric control work board. 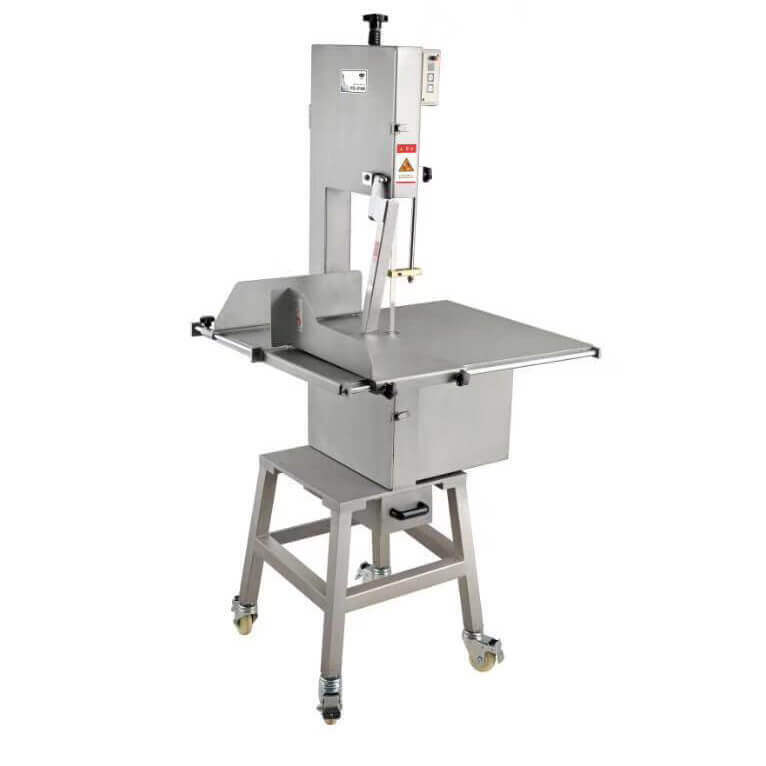 It is suitable for all kinds of small and medium-sized animal bones, frozen meat, fish bone, frozen fish, ice processing equipment. 1. Check if the equipment is clean and there is any foreign matter on the sawbone panel. 2. Check if the electrical system is in good condition. 3. Check if the saw blade is installed in the correct direction and the machine is reversed. 4. Check if there is any foreign matter in the machine operation. 1. Adjust the left and right position of the driven wheel: Loosen and fix the fixing screws on the pin bushing. Move the sliding positioning pin to the proper position, and the saw blade does not rub against the table core plate to tighten the positioning pin. 2. Adjust the pitch angle of the driven shaft and loosen (or tighten) the outer bolt of the cover to adjust the pitch angle of the driven shaft. When adjusting the test, the saw blade does not fall off or the saw blade does not rub with the bearing. 3. Adjust the tightness of the saw blade, adjust the top knob, adjust the tightness of the saw blade, and adjust the saw blade to not slip when it is adjusted to the saw bone. 4. Start the motor after pressing the cover. 1. When the saw bone machine is not in use, it is best to loosen the handle of the saw band tension on the top of the machine for 2 times, and then tighten the handle when the machine is turned on next time, so as to increase the service life of the saw blade. 2. When installing the saw band, pay attention to the direction of the saw blade, and the sawtooth tip of the cutting face on the right side faces down. 3. It is recommended to wear safety gloves during operation. 4. The blade should be pressed against the saw band, but the saw tip should not be touched, otherwise it will increase the noise and shorten the service life of the saw blade. 5. After the door of the sawing machine is opened, the safety switch will stop the machine, but the saw belt will continue to rotate for a while under inertia. Do not touch the saw belt by hand. 6. Never use the meat directly to cut it without any protection, especially when sawing smaller meat products, such as pig’s trotters. The high-speed saw band will hurt your fingers even if you wear gloves. The gloves can only delay and reduce the damage. 7. It is strictly forbidden to rub the saw blade and the table. 8. It is forbidden to rub the back of the saw blade and the bearing. 9. It is forbidden to loosen the saw blade to avoid falling off and slipping. 10. Do not put your hands or other objects into the sawbone area after starting the motor to avoid accidents. 12. If the machine has an abnormal phenomenon, it should immediately stop the machine and notify the Qingzhizhi repair personnel.